Triple corrugation of the shell giving it an increased impact resistant quality. The Helmet is made of specially formulated polymer which gives it an increased strength. The four point attachment of the cradle within the shell has a unique angular placement to provide optimum shock absorption. The head band is made of non-irritant and soft fabric to provide maximum comfort to the user. Ability use 2 point chin strap harnesses. Helmet is provided with an adjustable chin strap for universal adjustment. Comes with both Ratchet type and Manual adjustment to suit most head sizes. Ability to use either 25 mm or 30 mm wide accessory post so a wide range of attachments can be fitted. Scallop the shell and headband over the ears to allow the use of high attenuation earmuffs. Option of having company logos on front and rear. Triple corrugation on the shell. Can Be Attached To Face,Welding Shield,Ear Muff. Acme Champion White Industrial Safety Helmet with Inner Ratchet Fitting (Pack of 2) is a premium quality Safety Helmets from Acme Champion. Moglix is a well-known ecommerce platform for qualitative range of Safety Helmets. 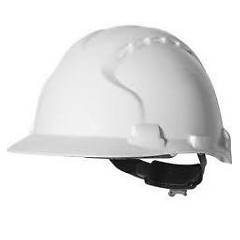 All Acme Champion White Industrial Safety Helmet with Inner Ratchet Fitting (Pack of 2) are manufactured by using quality assured material and advanced techniques, which make them up to the standard in this highly challenging field. The materials utilized to manufacture Acme Champion White Industrial Safety Helmet with Inner Ratchet Fitting (Pack of 2), are sourced from the most reliable and official Safety Helmets vendors, chosen after performing detailed market surveys. Thus, Acme Champion products are widely acknowledged in the market for their high quality. We are dedicatedly involved in providing an excellent quality array of Acme Champion Safety Helmets.